At 3.5 meters long and with a shoulder height of 1.7 meters, the cave bear was one of the giants of the Ice Age. Yet few appear to have survived until the last glacial maximum 24,000 to 19,000 years ago. Researchers from Germany, Italy and Canada have conducted analyses to find out what likely caused the extinction of these large herbivores. It is believed that the renewed cooling of the climate and hunting by humans ‒ added to the bears’ purely vegetarian diet ‒ increased the pressure on this megafauna species. Professor Hervé Bocherens of the Senckenberg Center for Human Evolution and Palaeoenvironment at the University of Tübingen took part in the study, which examined cave bear bones using the latest methods. The results of the study have been published in Historical Biology. Cave bears (Ursus spelaeus) lived in Europe during the Ice Age some 400,000 years ago and died out some 24,000 years ago. They were much larger than their closest remaining relatives, the brown bears, yet they were far less of a threat to humans. In an earlier study, the researchers analyzed the isotopes in collagen extracted from cave bear bones to show that the bears followed a vegan lifestyle. But it remained a mystery as to why they disappeared just as the climate was cooling again. Paleogenetic investigations showed that a population decline of cave bears took place around 50,000 years ago, coinciding with the replacement of Neanderthals by anatomically modern humans in Europe. Together with findings of cave bear bones with butchery marks made by humans or even stone spear heads embedded in their bones showing evidence of hunting, this suggested that cave bears declined and became extinct because of human exploitation. 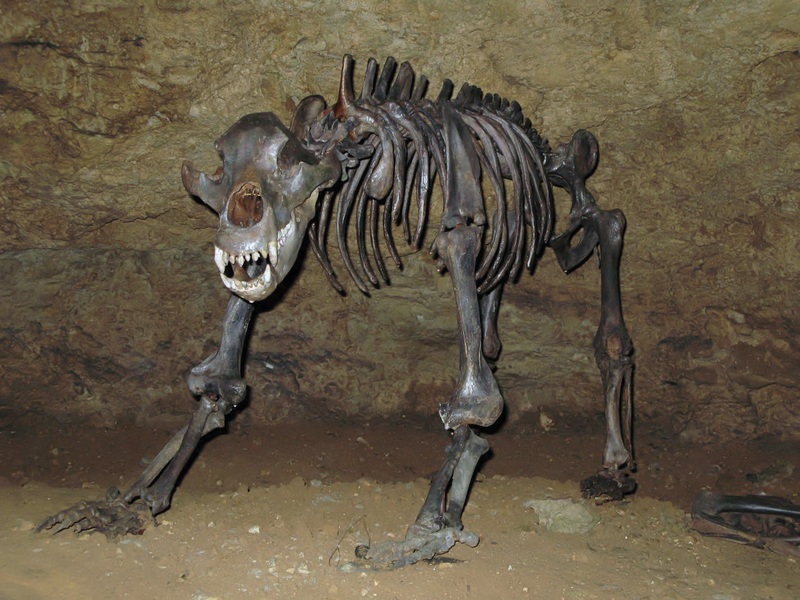 In several regions of Europe, cave bears disappeared well before the start of the last glacial maximum. However, some cave bear populations seem to have survived until 24,000 years ago – with one in northeastern Italy whose more recent dates suggest it was the last to die out. The researchers used bones from that location for the current study. They dated the bones using the latest methods and compared the bears’ diet with that of older populations. They also looked for signs of hunting and butchery by humans. The new radiocarbon dating confirmed that these cave bears lived as late as 24,000 years ago, after the start of the last glacial maximum. The bones also revealed evidence of hunting and butchery by humans. Isotopic analyses showed that the bears still did not eat meat, despite the colder climate. Hervé Bocherens suggests this lack of adaptability and the pressures of hunting by humans may have increased the stress on the cave bears ‒ such that they could no longer survive in a harsher climate. “It was likely this combination of climatic and anthropogenic factors which led to their extinction,” he says.